You can download VirtualBox from the VirtualBox website. Here you can download the Xubuntu 16.04.2 LTS desktop amd64 ISO (it’s from the official Canonical repositories). Now proceed to install the VirtualBox software. There shouldn’t be any particular issue with the installation process. I use the following commands to update the packages upon successful installation of Xubuntu in the virtual machine. You will have to type the password you chose during the installation. This will take some time depending on how many upgrades your OS will have to download. I sped up the video considerably. Finally restart the virtual machine and configure the machine with the required GMS2 dependencies. Follow the rest of the video to connect to your virtual machine and run/compile your projects. 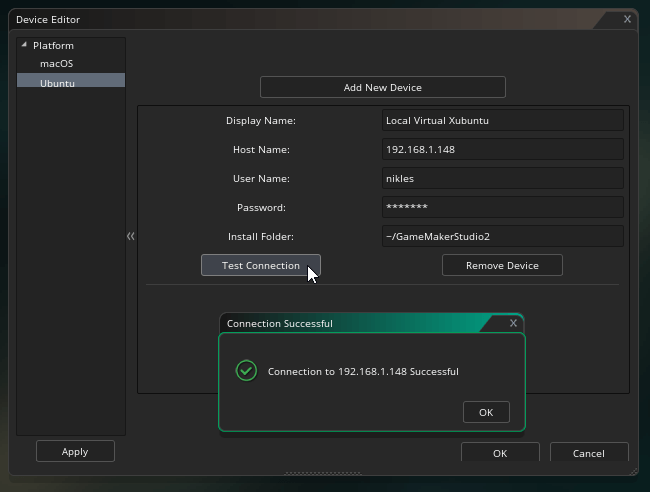 Hope this helps you setting up VirtualBox, Xubuntu and GameMaker Studio 2. Happy game development!